Decline of the English Aristocracy. The period between the World Wars in the Twentieth century has always been a fascinating time in Western History. The 1920’s and 1930’s saw a huge resurgence in creative energy in Europe, notably the Bohemian decadence of Parisian artistic circles and the radical Modernist aspirations of the Bloomsbury Group. Those two decades with all its turbulent European events marked the eventual decline of the Victorian formalities that restricted the 19th century, something that Oscar Wilde predicted would eventually falter. Brideshead Revisited is a sumptuous big screen adaptation of Evelyn Waugh’s complex examination of the erosion of the ideals that held the English aristocracy in so much high regard, from their religious and moral superiority to the many temptations that members of that class succumbed to, from adultery, to forbidden sexuality and substance abuse, to the many foreign attractions of marrying outside that closed world in order to insure their own survival. Remnants of that particular aristocracy have obviously evolved fifty years on and still dwell in secluded regions of England and Europe. However it was really during the 1930’s with the devastating effects of the 1929 Wall Street Crash and the ensuing economic depression that engulfed much of the Western World and the inevitable outbreak of World War II that marked the demise of the seemingly immovable landed gentry in Europe. Sound Familiar? Fortunately we don’t have any World Wars looming in this century, but the future can never entirely be predictable. 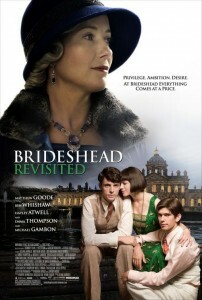 Historical observations aside, Brideshead Revisited is a complex and brilliant film, directed with a fluid and delicate eye for detail by Julian Jarrolds who rose to fame with Becoming Jane about the life of Jane Austen and Waugh’s novel, a magnum opus which is superbly crafted into an epic narrative by Jeremy Brook, screenwriter for such classic films as Mrs Brown and The Last King of Scotland, no easy accomplishment considering that in the 1980’s Brideshead Revisited was an extremely successful BBC mini-series mainly because of the scope of Waugh’s detailed analysis of the decline of British Aristocracy between the Wars. With BBC backing and between director Jarrolds, and the success of Jeremy Brook as a screenwriter, I was assured that this epic masterpiece would be given all the respect it deserves. Brideshead Revisited is like a tour-de-force of some of the best films on similar themes from the beautiful Merchant Ivory film, The Remains of the Day to the more recent critically acclaimed Atonement and of course the spectacular Wings of the Dove, all these films based on acclaimed novels by Kazuo Ishiguro, Ian McEwan and Henry James respectively. What sets Brideshead Revisited apart from these comparable screen masterpieces, is its particular emphasis on the religious aspect of this aristocratic families decline, their staunch attachment to Catholic principles despite a life rather decadently lived. For as long as the characters receive absolution for their sins before death, then their place in the afterlife was secured, as we are so rightly told by Brideshead Matriarch, Lady Marchmain a brilliant performance by Emma Thompson. From the gay and carefree days of Oxford in the late 1920’s to sumptuous Venetian palazzo’s complete with a cameo by White Mischief star Greta Scacchi, the camp and flamboyantly destructive Lord Sebastian Flyte, played by Ben Whishaw lives a self-indulgent and decadent existence, luring an unsuspecting artist Charles Ryder into this unscrupulous and almost fiercely protected yet infinitely opulent world. Ryder played with subtle dexterity by Match point star Matthew Goode is soon embroiled in the intrigues of an aristocratic family whose powerful religious convictions are as strong as their indulgences and desires are deceptive. As the characters develop and destroy each other aspirations, it really is the property of Brideshead itself, which takes centre stage, an imposing stately mansion filled with Roman Catholic art, fountains and sculptured gardens. Like the palatial homes seen in The Remains of the Day, A Handful of Dust and now in Brideshead Revisited, it was ultimately the ownership of such lavish estates that fell into jeopardy and were often auctioned off or decommissioned for military purposes once the full effects of World War II had embraced Europe, changing and scattering that aristocracy forever, since without property ownership, all claims of wealth are an illusion. Brideshead Revisited is a sumptuous cinematic feast, the kind of epic film that has seemingly long gone out of fashion to be replaced with the slick computerized world of American paranoia that Hollywood so duly produces. Of course it is essentially British, and any viewer who has a deep appreciation of literary films and especially of historical epochs will surely be grateful to see such attention given from the gorgeous costumes to the magnificent scenery from Venice to Marrakech lavished on a well-deserved and extremely pertinent period film about the fluid and almost traceable decline of a world long gone. With intelligent insights into such complex themes as religious superiority, addiction and forbidden desires, it is obvious that the strengths of Brideshead Revisited will be recognizable in the 21st century while such issues still remain as relevant in today’s society, as they were seventy years ago. Don’t miss such a superb classic as Brideshead Revisited, as the story demonstrates that no matter how powerful a society is, that power can quickly be eroded by historical events and economic insecurities, not to mention all the accompanying desires that so often plague the human race.